The initial idea for the project came from just two people: Eva and Christopher. with the idea and initiative of just two peole, Eva and Christopher, who regularly give up part of the or free time and resources to give the children of Nkoni the possibility of a better future. 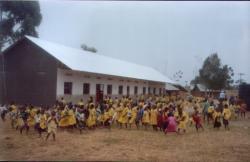 Most of the children here are orphans of aids because of the epidemic inflicted on the south Uganda.